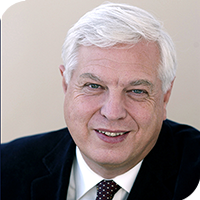 "The World of the Foreign Correspondent"
BBC World Affairs Editor John Simpson is a journalist, broadcaster, columnist and accomplished author. Born in 1944 and educated at St Paul’s School and Magdalene College, Cambridge. John joined the BBC in 1966 and celebrated his 50th Anniversary in 2016. John has reported from 140 countries and interviewed around 200 world leaders, including Mikhail Gorbachev and Vladimir Putin, Margaret Thatcher and every other British prime minister since Harold Wilson, every German Chancellor since Willy Brandt and every French President since Giscard d’Estaing. Among others he has interviewed Mrs Gandhi, Emperor Bokassa, Colonel Gadaffi, Bashir al-Asad, Nelson Mandela, and Robert Mugabe. He has covered forty-six wars on four continents, not to mention the trial and execution of Saddam Hussein in Iraq and of Nicolae Ceausescu in Romania. John has received most of the broadcasting industry’s main awards, including RTS journalist of the year (twice), three BAFTAs, an Emmy, Monte-Carlo TV Festival’s Golden Nymph, and the Bayeux award for war reporting. He is an honorary fellow of Magdalene College, Cambridge, a freeman of the City of London and president of The Chelsea Society. In 1991 he was awarded a CBE.